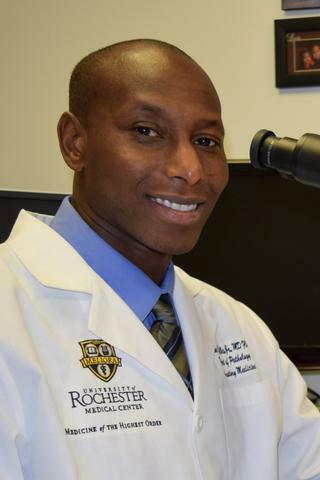 Dr. Jean-Gilles is Assistant Professor in the Department of Pathology and Laboratory Medicine at the University of Rochester Medical Center and director of the Genitourinary Pathology Fellowship. His research interests include bladder, kidney, and prostate cancer pathology, and imaging correlation. Thompson JP, Jean-Gilles J, Dogra V. "Testicular Microlithiasis in the Setting of Primary Extragonadal Germ Cell Tumor: A Case Series." Ultrasound quarterly.. 2017 Mar 0; 33(1):41-45. Xiao GQ, Jerome JG, Wu G. "Unilateral hypoplastic kidney and ureter associated with diverse mesonephric remnant hyperplasia." American journal of clinical and experimental urology.. 2015 3(2):107-11. Epub 2015 Aug 08. Dunne RF, Sahasrabudhe DM, Messing EM, Jean-Gilles J, Fung C. "A case series of transformation of teratoma to primitive neuroectodermal tumor: evolving management of a rare malignancy." Rare tumors.. 2014 Jan 23; 6(1):5268. Epub 2014 Mar 18.